Going, going, gone is the familiar cry of the auctioneer, and we’re used to hearing it for works of art or antiques, and news of them commanding record prices. But more and more, auction houses big and small are selling off rock memorabilia as it becomes a huge business. Make no mistake – this is a very lucrative business indeed, with sales often exceeding £100,000 an item and rising to a million. That might not take it into the stratospheric realm of fine art, which can go for many millions, but in every sense rock memorabilia is a young form. The mere fact that auction houses take it seriously (and, let’s not forget, make a handsome profit on the sales) gives it respectability. 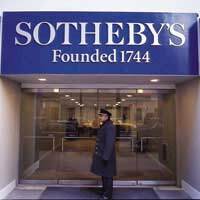 Along with Sotheby’s, Christie’s is probably the most respected auction house in the world. They’ve eagerly embraced rock memorabilia, and taken in some of the highest prices ever for items. In 1999, for instance, Christie’s set what was then a world-record price for a guitar when Eric Clapton’s famous “Brownie” Stratocaster, which he’d used onstage for years, sold for $450,000, as part of an auction to raise funds for the star’s Crossroads charity. Five years later, when Clapton held another guitar auction at Christie’s, “Blackie” (another Stratocaster) smashed that record by fetching $959,000, while a guitar owned by the late blues player Stevie Ray Vaughn brought $550,000. Even the auction catalogue was in demand from Clapton fans and guitar collectors, and was selling for $40, making it an incidental (and possibly valuable in the future) piece of rock memorabilia. But Christie’s have sold far more than instruments. Beatles lyrics, a demonstration copy LP of The Freewhelin’ Bob Dylan (with amendments in pen by Dylan) , and even a 1972 taped interview with John Lennon were among the items that went up for sale in late 2006 at a Christie’s auction of rock memorabilia, and many far exceeded their sales estimates. Obviously, to play in that league, you need a very healthy bank account, or something to sell that’s both very desirable and quite rare. But Christie’s don’t have a monopoly on auction-worthy items. Cooper Owen UK also sell high-ticket lots (they auctioned off a childhood anthology that had belonged to John Lennon for more than £126,000, and held a sale of Johnny Cash items – since his death, Cash has become very collectable). Interestingly, they also have a shop of rock memorabilia. With money to be made, it’s no surprise that everyone’s getting in on the act. Julien’s Auctions, which began in 2002, specialising in entertainment memorabilia, has held a number of rock auctions with much more affordable rock memorabilia. At one in December 2006, the item bringing the highest price was a John Lennon jacket that had been in Madam Tussaud’s and brought a relatively modest £11,000 – or you could have picked up a cheque signed by Madonna for a little over £200. Even relatively minor stars are auctioning off memorabilia – at the same auction there was a collection of items belonging to 1970s pop idol David Cassidy (as a sign of the spiralling market, perhaps, a guitar he’d owned and played fetched over £6,500). That’s the mid level. There are plenty of others, too, and you can look in the various record collector magazines to find them, or browse online – It’s Only Rock ‘N Roll has auctions that won’t break the bank, for instance, and it’s just one of several. In other words, if you want to get started, but you’re on a budget, there’s still something for every purse. But as with all auctions, don’t let yourself be carried away in a bidding frenzy. Keep your eyes on what might be valuable in the future, rather than what’s necessarily hot right now.